This young adventurer needs a comfortable and light apparel for this Amazonian excursion. This lady doesn't take for granted that a public safety uniform is boring. Posh up her outfit and make it attractive. Make this day of sea exploration perfect and assess to this little curious lady a fun and colorful outfit. These two companions need you to create a colorful and warm style for them. This body guard is use to live dangerously. She still have to look stylish since she is in the entourage of the celebrities. Help her looking her best! Help this radioactive girl finding an electric and innovative look. Come one! Come all! Welcome to the Circus! This is your chance to play with the different costumes before the show. Sequin, sparkle, color, and feather are all available to address and adapt for a stellar performance. Help our spider heroine find the perfect outfit that will help her courageously face countless villains in her adventures. Don the mask that will send fear into the hearts of criminals! Get ready for a space trip by dressing up in cool outfits! 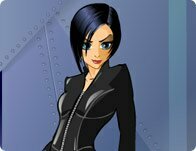 Dress up Trinity and head out into the Matrix!